“Different things make different women vulnerable,” Crenshaw, a scholar and advocate, said Friday. 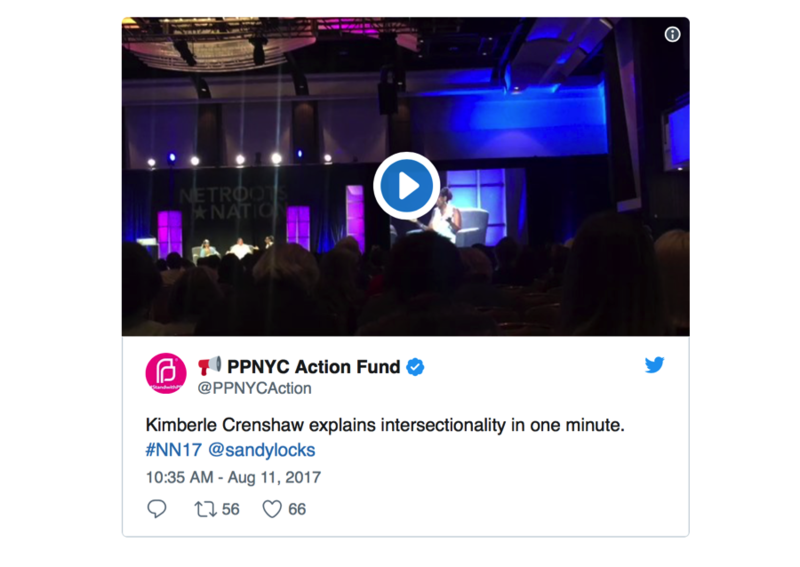 It took Kimberlé Crenshaw, an esteemed civil rights advocate and law professor, about 60 seconds to lay out the importance of “intersectional feminism” on Friday ― and the internet could not get enough of it. Intersectional feminism examines the overlapping systems of oppression and discrimination that women face, based not just on gender but on ethnicity, sexuality, economic background and a number of other axes. On Friday, during a panel discussion at the annual Netroots Nation conference in Atlanta, she gave a gloss on intersectionality in a way that made clear the immense value of the concept. Crenshaw noted some of the ways in which intersectional feminism helps activists advocate for women of all backgrounds and identities. Thandie Newton in the Guardian: We don’t just need more black women in movies. We need intersectionality, now. Check out Kimberlé Crenshaw in Another Round's podcast discussing #SayHerName as well as haircare! AAPF Co-Founder and Executive Director Kimberlé Crenshaw is being featured in Essence magazine's list "100 Woke Women" highlight trailblazing women's leadership. LA Times article on recent Her Dream Deferred event "The Not So Silver Screen" that explored the status of Black women in entertainment industry. An interview with Executive Director Kimberlé Crenshaw is included. Check out coverage on #HerDreamDeferred, and more. The Art Newspaper, March 8, 2017. Check out our Executive Director Kimberle Crenshaw in @USATODAY! "In this Op-Ed piece, Chicago activist Eva Lewis explores how aggressive policing impacts black girls and women, including transgender women. Trigger Warning: This post contains information about violence that some readers may find upsetting. Here are some highlights on the work AAPF & our executive director, Kimberlé Crenshaw have been doing! The New York Times, Feb. 7, 2017. The Kalamazoo Index, Feb. 8, 2017.